Wave energy is produced when electricity generators are placed on the surface of the ocean. The energy provided is most often used in desalination plants, power plants and water pumps. Energy output is determined by wave height, wave speed, wavelength, and water density. To date there are only a handful of experimental wave generator plants in operation around the world. As any board or body surfer will tell you, the ocean’s tidal currents pack considerable wallop. So why wouldn’t it make sense to harness all that formidable ocean power—which is not unlike that of the rivers that drive hydropower dams or the wind that drives wind turbines—to make energy? Is Ocean Power an Option? According to Energy Quest, an educational website of the California Energy Commission, the sea can be harnessed for energy in three basic ways: using wave power, using tidal power, and using ocean water temperature variations in a process called “ocean thermal energy conversion”. Ocean Wave Power In harnessing wave power, the back-and-forth or up-and-down movement of waves can be captured, for example, to force air in and out of a chamber to drive a piston or spin a turbine that can power a generator. Some systems in operation now power small lighthouses and warning buoys. Ocean Tidal Power Harnessing tidal energy, on the other hand, involves trapping water at high tide and then capturing its energy as it rushes out and drops in its change to low tide. This is similar to the way water makes hydroelectric dams work. Already some large installations in Canada and France generate enough electricity to power thousands of homes. Ocean Thermal Energy Conversion (OTEC) OTEC system uses temperature differences between deep and surface waters to extract energy from the flow of heat between the two. An experimental station in Hawaii hopes to develop the technology and someday produce large amounts of electricity on par with the cost of conventional power technologies. What’s Being Done with Ocean Power? Proponents say that ocean energy is preferable to wind because tides are constant and predictable and that water’s natural density requires fewer turbines than are needed to produce the same amount of wind power. 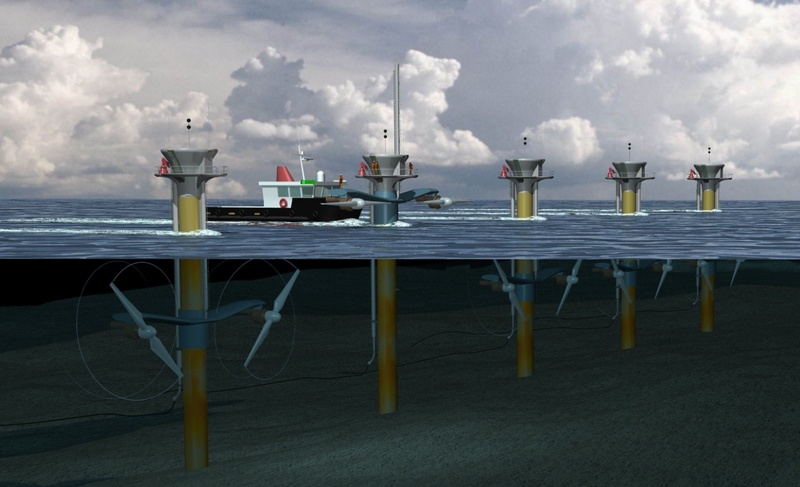 Given the difficulty and cost of building tidal arrays at sea and getting the energy back to land, however, ocean technologies are still young and mostly experimental. But as the industry matures, costs will drop and some analysts think the ocean could power nearly two percent of U.S. energy needs.